"My mom is the best cook ever!" "My big brother can take out your big brother any day!" 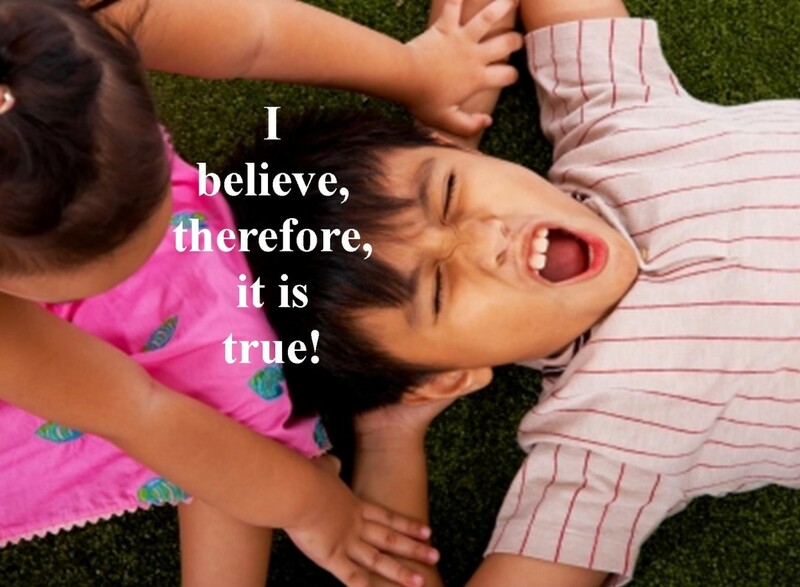 As children, our beliefs were simple and profound. We just knew that our family was the best, and no one else could match them! Unfortunately, there came a time in life, when we realized that even though we wanted something to be true, it wasn't necessarily so! During adulthood, we come face to face with the beliefs that we carry with us from our childhood, and begin to question their validity. Some we are able to discard, others are so ingrained that they remain a part of our psyche all of our lives. These long-standing beliefs become assumptions upon which our actions are based. In this hub, we will explore what these beliefs are, how they affect our thoughts, feelings, and actions, and how we can change them. "I was made this way." Many people believe that they were born the way they currently are. Psychology has long debated "nature versus nurture" and has come to the conclusion that although we receive physical and personality traits through our genetic heritage, it is the response of our caregivers, their current reality, and what we do with it, that ultimately shapes our destiny. "The world is an unsafe place." Perhaps our parents went through some horrific experiences before we came along and like Marlin in the movie, Finding Nemo, pass that belief on to their children. When Nemo went to school, he realized that others did not have fears about venturing into the unknown. This caused him to question his father's actions. "You have to work hard to make it anywhere in life." Those in the baby boom generation worked hard physically in order to be where they are today. They knew the value of education and made sure that their children didn't have to suffer like they did. In our current society, however, things are different and technology is advancing at unprecedented rates. Most people today seek information through surfing the Internet rather than purchasing and reading books or taking classes. "You have an essential value, worth, and dignity just by virtue of the fact that you're a human being." "Self-esteem is delicate and must be guarded and protected." As much as the "feel-good" era of the 70's advanced positive psychology, it has been concluded more recently that we have to do something to give ourselves these feelings. We need to learn skills, live in productive ways, and realize that we have innate worth as human beings. It is okay for people to make mistakes and learn. These are only a few common core beliefs that affect the way we are raised, how we see the world, and the decisions we make on a daily basis. Every behavior that is a part of us is the result of a core belief that has been taught, observed, and lived in our lives. Robert S. Kelly, in his song I Believe I Can Fly, tells how beliefs can and do change. When we find ourselves in a rut with no way out, the key to our better future lies within ourselves. The paragraphs after the video talk about recognizing our mistaken beliefs, how they are detrimental to our emotional health, and what we can do to change them for the better. In The Anxiety and Phobia Workbook, Edmund J. Bourne, Ph. D., writes about "mistaken beliefs," or those that have a detrimental affect on us emotionally. He indicates that we may learn them in our childhood through the example or teaching of our primary caregivers. Some are adopted when we react to things we experience in life. The table below lists examples of mistaken beliefs and how they affect us emotionally. We may not recognize a mistaken belief until we experience the consequences of it. 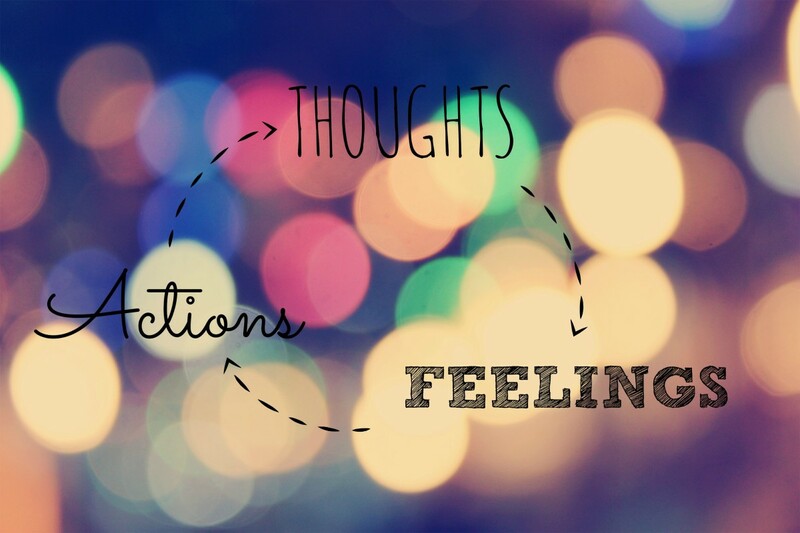 Irrational thought patterns and behaviors surface when we have emotional difficulty. 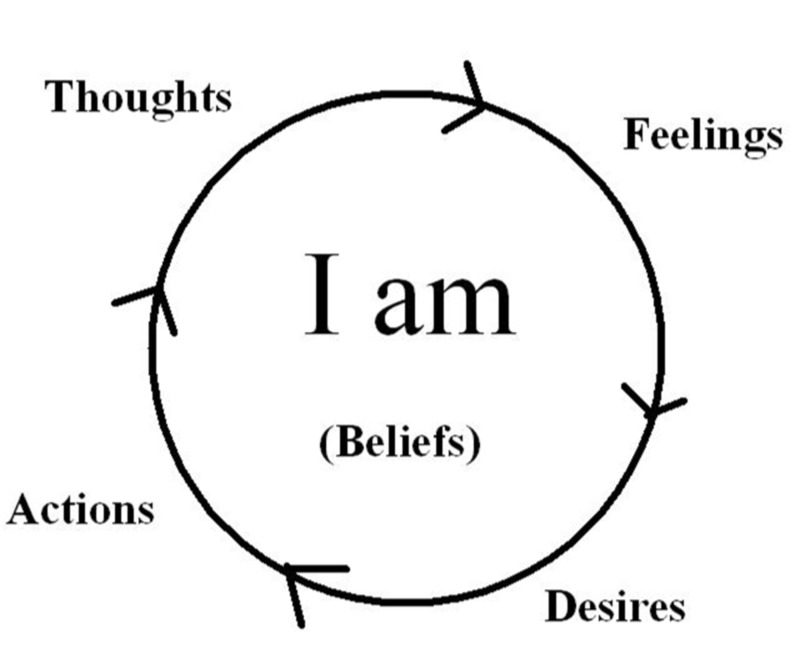 Notice in the I Am Wheel, that beliefs are at the center, and desires, thoughts, feelings, and actions rotate around them. Our "I am" beliefs, such as "I am strong," "I am loved," and "I am able," are the basis for our self-worth. Positive "I am" beliefs lead to feelings of strength, choices for our better health, and treating others with dignity and respect. Negative "I am" beliefs, such as "I am stupid" or "I am ugly," automatically lead to negative thought patterns, feelings, desires, and actions. The individual with these core beliefs has no inner strength, therefore, will easily fall prey to power struggles, putting others down, bullying, and hurting others in an effort to build feelings of worth. To find the mistaken beliefs, we have to rewind the wheel. First, we look at our actions, then our desires, thoughts, and beliefs. 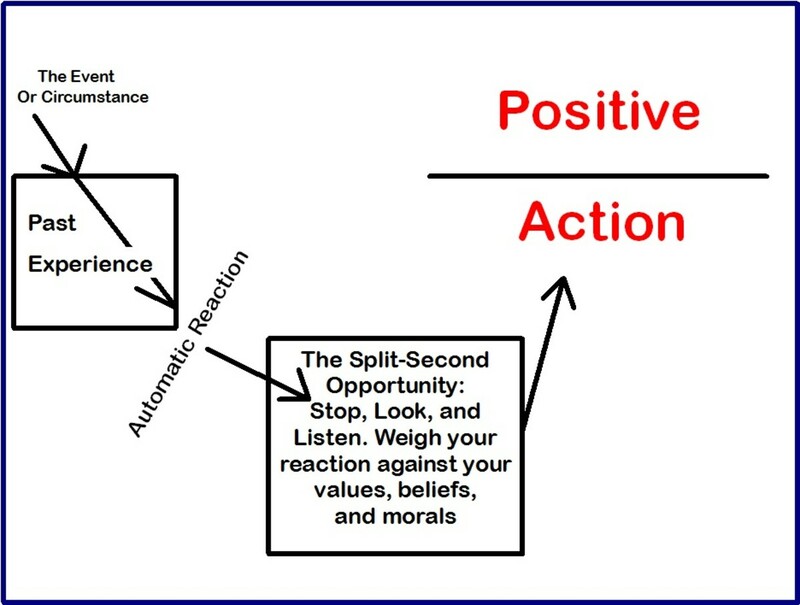 Going through this process on a regular basis, we start to see patterns of behavior that result from particular beliefs. We have "aha" moments when we realize that the roots of these behaviors started in our past with particular situations or events. As we see how they are affecting us, we are in a position to make choices to change them. Once we are able to identify our mistaken beliefs, we are in a position to do something about them. Dr. Bourne teaches that we need to question and challenge them, find the evidence for or against them, and if they are found to be unprofitable, replace them with better ones. Belief: If I make a mistake, I am a failure. In other words, If I am not perfect, I am worthless. What is happening? I am human. I make mistakes. I do not know everything and I do not have time to learn it all. No matter how hard I try, I do something wrong. What am I feeling? I am embarrassed. Every time I turn around, I do something I shouldn't. I am angry with myself because I can't get it right. I hate it when this happens! What am I thinking of doing? I am thinking about hurting myself. I am not worth living. I am flawed and hopeless. What are the consequences? If I am no longer here, my family won't have to worry about me anymore. They would be better off without me. Is that really what I want? Wait a minute! What am I saying! No! They wouldn't be better off without me! I am a vital part of this family! I've seen what happens to the families of people who have taken their own lives. This is not the answer! Is there something better I could do instead? I do not have to be perfect. I do not have to do this alone. I can turn to others who will help me. There are people who love and accept me in spite of my imperfection. What would be better for me and others in the long run? If I make a mistake, I will acknowledge my error and correct it. If I don't know how, I will find someone who does. 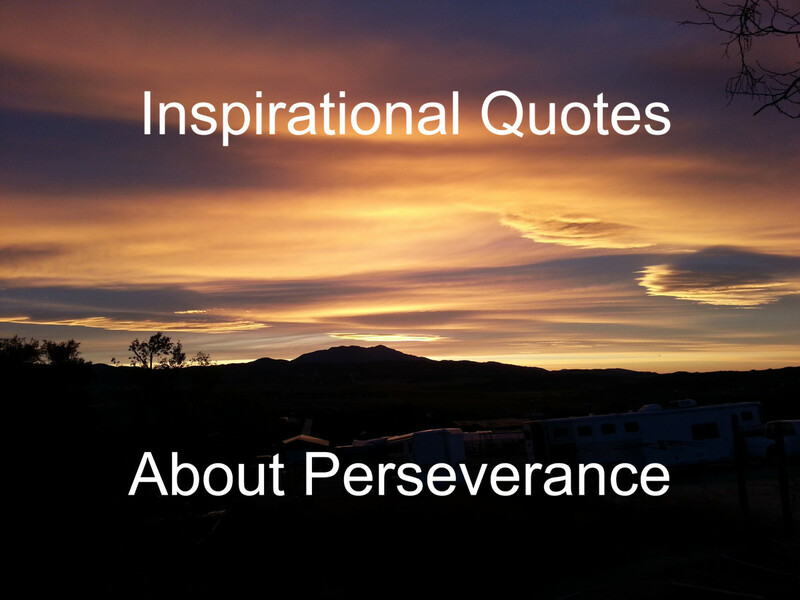 I am not a failure unless I stop trying, and I will not stop trying! I am a worthwhile human being! The result of this process is an affirmation that can be posted in a visible place where we will see it frequently. Reading and repeating it often allows us to re-program our beliefs, and as a result, change our emotional health. This hub is not meant to diagnose or treat psychological illnesses or disorders. If you are experiencing abuse, suicidal thoughts, hallucinations, nightmares, insomnia (inability to fall asleep), panic attacks, or thoughts of hurting another person contact a mental health professional. As human beings, we have the ability to analyze, interpret, research, and solve. We are able to look beyond what we already know and find something that is better for ourselves. We do not have to continue in the "status quo" that we have lived all of our lives. 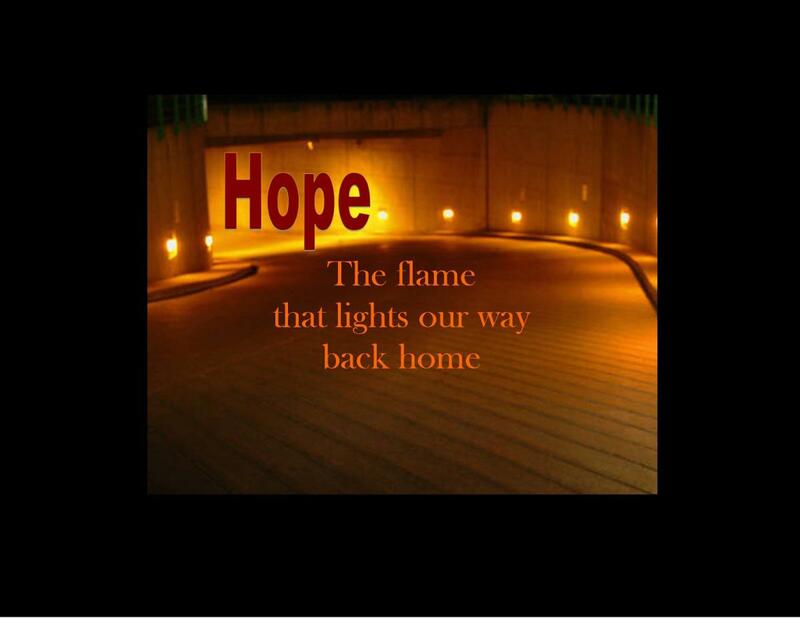 Hope is the ability to look above and beyond our current circumstance, realizing that it is only temporary. Things change. They always do. No matter where we find ourselves at the current moment, whether in happiness or misery, that state is not permanent. It will change. The only constant in this world is change. Because things are changing all around us, it is only natural to realize that we can change. We do not have to keep going the way we are now. If our emotional health is in question, we have the ability to figure out how to make things better. 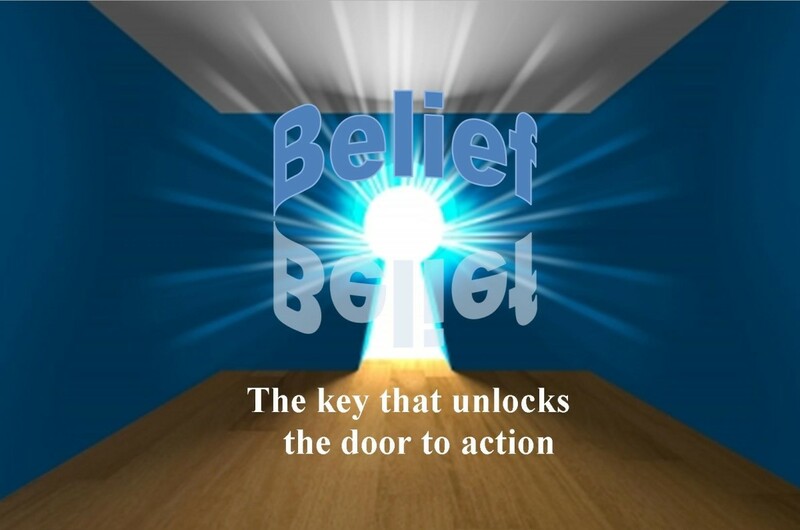 Our beliefs affect our thoughts, feelings, desires and actions. Now is the time to check them out. Thanks, gsidley. We all come into adulthood with a set of beliefs that may or may not be adequate for our success. As we find attitudes and beliefs that do not serve us well, choosing to abandon them for more suitable ones is necessary for our well-being. As we do so, we discover that there are time-honored truths that become self-evident we can hold on to throughout our lives. These become a foundation for our future. A quality hub on an important subject. Deeply held beliefs about ourselves, the world and the future impact significantly on our emotional wellbeing. And once a strong belief is established it tends to be self-sustaining, by filtering out (ignoring or distorting) evidence that doesn't fit with the existing belief while selectively focusing on evidence that is consistent with it. That is an excellent way to change beliefs, CherylsArt. In my hubs, I have written about what I call visualization. You have used the term, imagination. When we couple this with affirmations, we have a much more powerful way of changing our thoughts, feelings, and actions. Thanks for reading and commenting! I have used both affirmations and also imagination to change my behavior. Imagining myself responding in a different way is quite powerful, and usually the results happen more quickly, though it might take a few times for it to be affective. Yes, teaches. For some, it requires professional assistance. I know for me, it took medication and several years of therapy to loosen the grip of some of the mistaken beliefs I had. I still find myself drifting back to them when things get difficult in life. I use the techniques that I write about on a regular basis. That helps remind me of what I need to do. I, too, hope that my writing can help others that are having difficulty in this area. Thanks for reading and commenting. This is a really good article on this topic and I do hope may stop by for the valuable advice. I believe many people cannot overcome the negativity you mention. When they are constantly surrounded by it, it tends to become part of their emotional being. You are welcome, MsDora. I have had to do the same. When I realized that my beliefs were holding me hostage, I had to do some major housecleaning! Thanks to helpful counselors and classes in changing my thought patterns, I, too, have found peace and happiness. I still find new things to learn as I grow older, however. Blessings to you and yours! I appreciate your comments, ChitrangadaSharan. Life is full of transitions. Our bodies change, our circumstances change, and society changes. When we find the truths that are constant, and hold on to them, it gives us a foundation for weathering the changes. Teaching our children is vital, and we can have such an impact on their future lives. Thanks for reading and sharing your thoughts! Excellent article, Denise. Beliefs have such a powerful effect on our emotions and our whole lives. I've had to rethink some of mine, and been happier with some adjustments I made. Thank you for clarifying some important issues here. Very nicely done, thought provoking hub! It is true that we grow up with beliefs as explained by our parents. As we age, we may or may not change, depending upon what we have been taught is still relevant or not. Change is inevitable and one should be flexible enough to adapt to changes according to the changing times and environment. True and healthy parenting requires to teach children to be flexible to changes. Thanks for this excellent hub. Voted up! Thanks, Catherine. Change is difficult. When we realize that it will not last, we are able to weather it much more successfully. Making adjustments in our thought patterns helps bring our beliefs to a better vantage point, and then change becomes our friend instead of our enemy. Very well done with good advice. I think I have a few of the issues you mention. I do agree with you about change. When things are not going ell, just ride it out. Things will get better. Thanks, lisavanvorst. That is the amazing beauty of humanity! We have the opportunity to determine for ourselves what is best in our lives. We do not have to depend upon others, whether the things we learned in our childhood, or following the crowds around us. We can find out for ourselves what it true. I enjoyed reading this. True we are raised as children with the morals and beliefs our parents put upon us. However as we get old we mature and develop our own beliefs. The problem in society is that sometimes others try to persuade us to their beliefs and opinions. As individual we must develop and embrace what we believe in. Great Hub!